FREE Craftsman Metric Socket Wrench Set! You are here: Home / Great Deals / Christmas Deals / FREE Craftsman Metric Socket Wrench Set! 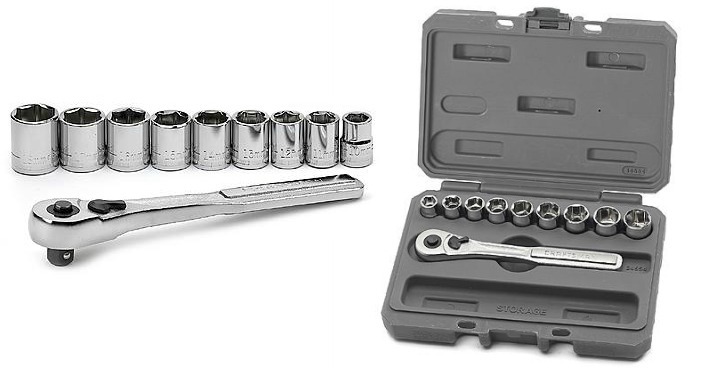 Sears has this Craftsman Metric Socket Wrench Set on sale for $9.99 (Reg. $20) and you can get back $10.09 in Shop Your Way points, making it FREE! Craftsman 10 Pc 3/8 in Metric Socket Wrench Set provides a wide assortment of sockets sized to handle a wide range of nuts and bolts. The six point sockets offer good side wall contact. The set comes with a tray organize the pieces and make this set very portable. 10 Pc Metric Socket Wrench Set makes a great gift or addition to an existing Craftsman collection of tools. Buy with confidence because Craftsman tools are guaranteed forever — simply return for replacement or repair if necessary.